Based on a true story, Tricia Goyer's A Christmas Gift for Rose is set during the World War II era. Tricia Goyer, a homeschool mom, is a compelling writer, and this book is especially gripping because of its historical accuracy. This is a lovely, heartstring-pulling book about Rose, an Amish girl who finds as she grows into a young woman that she was born an Englisher but was raised in a loving, caring Amish family. How did those circumstances come about? The love of her life, Jonathan, defied Amish laws and served in the army during the war, feeling it was his God-given calling and duty. Serving as a medic, he helped many. Upon his return home, he helped one in his community. He returned to Berlin hoping Rose continued loving him. Will the relationship be repaired? Will being born English cause Rose to leave the community, and will she be able to connect with her birth family? 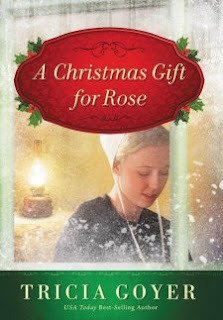 Jonathan gives Rose a very special Christmas gift -- what impact does it have on her life? I love her comparison to "Heidi," a book she was reading to the children. This was an inspiring book proving that faith, belief, and a nearness to God is always there, but we have to pay attention to His plan. Loved the book and am anxious to share it with friends!